A letter has just arrived from my six-year-old self. Dad just took me and Frank to the movies. I was surprised! We never go to the movies. I love the movies, even though I have not seen a lot of movies. I saw Mary Poppins in a theater a long time ago, but most of the movies I have seen were on TV—NBC’s Saturday Night At The Movies. But it’s not really at the movies, it’s at my house. So is that even really the movies? But this was a real movie in a movie theater, with seats and everything. Mom had to go to a shower downtown. Dad had to drive her because she doesn’t like to drive, especially downtown, and instead of driving all the way back home and then having to drive back downtown to pick her up again, he just took me and Frankie to a movie downtown and waited for her to be done with her shower. I do not know why you have to go downtown for a shower. Just take a shower at home. I wish my mother would take more downtown showers if it meant I got to see more movies with my Dad. I think more movies might cheer Dad up because Dad is always very grumpy. The lobby of the theater was big and kinda scary, and there was also a big smell, but it was a good smell—I think it’s the popcorn but it might just be the smell of movies. There were posters and pictures on the walls of movies I had never heard of. But I could mostly read the titles. 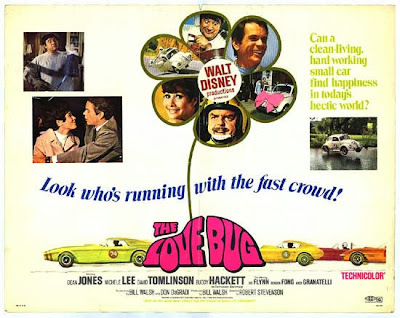 They even had a poster for the movie we were seeing – it said THE LOVE BUG and had a picture of the love bug, which is really a car. Dad bought me and Frank our own popcorns, so we didn’t have to share and fight. I think it might have been the best thing I ever ate in my whole life. It was warm and fluffy and had melted butter and salt. No matter how much I ate, I just wanted to eat more—it tasted that good. I like pancakes and Mom’s spaghetti, but popcorn wins. Trust me, Future John, when I am you I will eat A LOT MORE POPCORN. You can buy as much as you want anytime day or night and eat it anytime you want day or night, and I can’t think of any reason why that would not be great. I am jealous of you! Even though you are me! The Love Bug was funny. I laughed a lot. I don’t remember Dad laughing, but he didn’t fall asleep, and that must mean something because at home he always falls asleep on the couch when he watches TV. This little white car was like a person, but a magic person, and his name was Herbie and he could do lots of tricks. I wish my Dad’s company car could do tricks like that. Herbie could drive himself and he squirted oil on the bad guy’s pants. That oil thing made me laugh a lot. I usually laugh whenever something squirts. I am six! Herbie the car was a good friend to the man and lady and their friend who talked like a baby. It made me wish that I could have a car friend that squirted oil and he could drive me to first grade and the candy store and to a movie theater to buy some more popcorn. I would be a good friend to a car. Also, I liked that he had a name. When I grow up, I want to name all my cars. Don’t forget that, Future John! I could tell Dad was getting bored towards the end of the movie because I could hear him jingling. Dad wears old suit pants, never jeans, carries his change and his keys in his pockets, so he jingles at the littlest moves. He was getting antsy towards the end of The Love Bug, so he started moving his legs around and that set off the jingling. The two sounds that Dad makes all the time are that jingling of keys and change and the “harrumph-rumph-rumph” when he clears his throat, which is a lot, because he smokes five packs of cigarettes a day. My father sounds like an ice cream truck driven by a lion. I am going to talk to Dad on the way home and see if we can go to the movies a lot more—like maybe once a week? Maybe twice a week but only on the weekend because I know that my Mom and Dad would never let me go on a school night. I love school, but I hate school nights. You are lucky, Future Me, you never have school nights! Right? There was much more to the letter – too much to print here – because that 1968 screening of The Love Bug with my Dad is one of my happiest childhood memories. I still cannot believe how much of that screening I remember… and in such detail. I remember my Dad’s car (Even after he dropped my Mom off, my brother and I stayed in the backseat, like all kids did then, as if he was our chauffeur. We never wore seat belts; we’d just slide around that big bench seat, bumping into each other.) I remember what the movie sounded like—those enormous old movie palaces had a booming, hollow, stereophonic sound. I had never heard anything like that before. There are copious peanut butter and jelly fingerprints at the bottom of the page. I did not sign it. CONFESSION: I’m afraid I can’t really tell you much more about The Love Bug as a movie. I have only ever seen The Love Bug once: the screening with my Father that I describe above. I have never wanted to risk that a second screening would, in some way, ruin it for me. Mary Poppins in 1965, The Love Bug in 1968, and The Sting in 1973 were the only movies I ever saw in a theater with my Dad. That’s three movies in an eight year span – three movies in the entire 28 years I had him as my father. TANGENT: A few years before she passed away, I took my Mom to a holiday screening of Little Fockers. She loved it. She told me it was the first movie she had seen in a movie theater since… our family outing to see The Sting, thirty-seven years earlier. The mind boggles. My Dad grew up during the Great Depression, so it was of the utmost importance to him that he put me to work as soon as possible. Even my paper route was… ambitious. On Saturdays, my Dad drove me all around the Chicago suburbs, filling coin-op newspaper boxes with the big Sunday edition of the Chicago Daily News, and later the Chicago Sun-Times. Afterwards, we would go to McDonald’s for lunch—every time—and I would get a Big Mac—every time. I still associate Big Macs with my father and those Saturdays we spent together. Is it any wonder McDonald’s courts children? McDonald’s is like the Jesuits—give them a child before he is seven years old, and he will be with them for life. The Happy Meal is the gateway drug to a lifetime of unhealthy eating. I find myself wondering if my love of the movies (and Big Macs) is somehow rooted in chasing the dream of spending just a little more time with my Dad. We get so caught up in the inconsequential stresses of our adult lives—the remodeling job went over schedule, I dinged the door of my car, I am unsure about what to do after retirement. I wish all of us really could receive missives from our younger selves on a regular basis. It would be a potent reminder of how easy it once was to be indescribably happy. In 1968, all it took was a matinee and a Dad. That was lovely JB, and as a straight, bearded man that's not a word I use often. I could really hear little JB's voice in there. I have a great relationship with my Dad but, because they were so infrequent, our few movie outings (Gremlins and Who Framed Roger Rabbit? are two of the probably only 4 or 5) are some of my favourite memories. I totally relate to this as well. One of my favourite memories was a surprise movie outing as a kid. Dad came home from work and just said, "come on kids we're going to see Flight of the Navigator". My little head nearly exploded. THE MOVIES! (my dad wasnt a big movie person, so this was far from typical for us). I think the sheer joy of that memory is why I am so fond of making any little thing I do for someone else a surprise, because it just makes everything so much better. 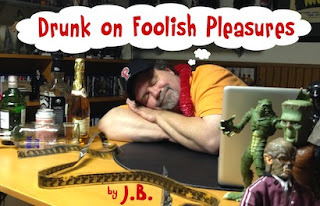 To parrot Mr O, Lovely article JB. So heartfelt and well written (and credit to Jan too, I assume). This is funny, beautiful and insightful. Well done, JB! Nice piece of writing, sir. Sure brings up memories. I had exactly 2 movie theatre experiences with my father, and recall both the flicks we saw. The first was The Towering Inferno! His choice, I believe. Amazing to see at the cinema and, I believe, my very first cinema experience. The second was The Mighty Peking Man (my choice), which to the little me was epic, but must have been a slog for the old man. I guess he was a trooper. I tried to get him to go with me to see the long version of The Big Blue ("version longue") many years later, but he wasn't into it. He got lucky that night. BTW, The Love Bug still holds up.